This has turned into one of the biggest news days in Air Racing since Sunday at Reno 2006! I just got off the phone with Ken Dwelle and he shared a bit of information which relates to the earlier story about the Rare Bear. 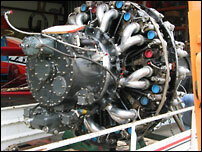 By the time you read this, the Rare Bear "clone" engine that was last raced on Critical Mass at Reno 2003 will be on its way to the Reno Stead airport and its new owner, Rare Bear Air Racing! Now on to the title of this story Ken told me that the airplane will be going to the Sanders for the sheet metal work to return her to a stock two seat dual control configuration. "It's not going to be a popular decision" said Dwelle, "but the airplane hasn't turned a wheel in three years. 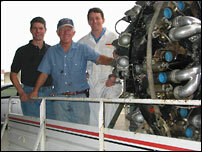 We're going to make it a fun family airplane that we can fly every weekend". GOOD NEWS Ken told me that they will return to Reno with the reconfigured airplane. "We'll race it in the silver" Ken said, adding that they would not be "wicking it up" as they did in the past with their quest for a gold win at Reno. 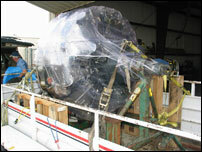 The airplane will receive a stock 26 WD motor and, as Ken put it "it will look just like 911 only with different paint". 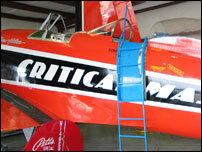 Asked whether the airplane would retain the Critical Mass paint job, Ken replied "that has not yet been decided". Personally, the author is both disappointed and thrilled at this news. Critical Mass, as she last raced, was to my eye one of the best looking racers of all time. It will be sad to lose that part of her. I am, however, very happy to hear that the Dwelle team will be returning to Unlimited racing! It's just not the same without that family and their team on the ramp! 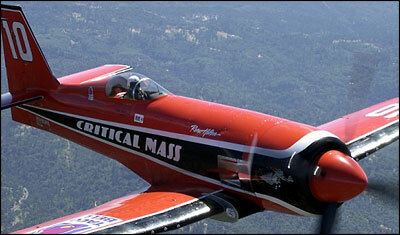 Further news from the Dwelle team For 2007, they will return to T-6 racing. TJ Dwelle will race Tinker Toy and Ken will race Kitchen Pass. This family brings much to the sport of Air Racing and having them back with such a full stable of race planes will be great for the fans and the sport. Watch for much close action in both T-6 and the Silver Unlimiteds! With many "super stock" Sea Fury airplanes in the field, and the competitive Dwelle family in both classes, 2007 is already looking like a very good year for the sport!